This beach ranks #7 of the "Best islands in Baa Atoll"
Dusit Thani Maldives is a 5-stars hotel, giving a unique opportunity to get a small piece of Thailand in the Maldives. What else could be better? The minimum cost of room is US$700 per night. But for the majority of dates the price starts from US$900. Overwater villas of any kind don't make sense, as the seabed is rocky almost everywhere. So even if you will be able to get down to the water, you won't get much satisfaction. As for the snorkelling, it's good in any place just near the coastline. Fly to Male international airport (MLE). Next take a flight to the local Dharavandhu island, located nearby. The domestic flight takes 20 minutes. The hotel's speedboat will deliver you withing 15 minutes. The total cost of transfer for the round-trip is US$400 per person. 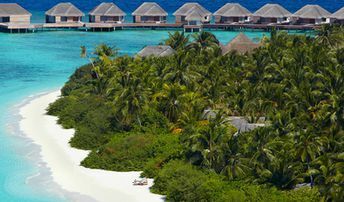 The best time for a beach holiday in Dusit Thani resort of the Maldives is a dry season from January to April.